Promotional notepads featuring a full color imprint. Logo adhesive notepads featuring a full color imprint. Perfect to leave by your phone for to-do lists, reminders and more! 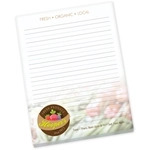 Use the entire sheet, edge to edge, on this 3" x 6" Full Color BIC Non-Adhesive Custom Notepad! Order today! Place your very own business card on this Full Color Magnetic Custom Business Card w/ Things To-Do Notepad! It's strong .020 thick magnet features a 50-sheet notepad. Clients will take note of you and the things they need to purchase with this Full Color Magnetic Custom Business Card w/ Shopping List Notepad! The 8.5" x 11" Full Color BIC Non-Adhesive Custom Notepad is perfect for school, financial institutions and more. Add ruled lines for FREE to stay organized with your note taking! Order today! Perfect for notes, phones messages, to-do lists and more! Use the entire sheet, edge to edge, on this Full Color BIC Non-Adhesive Custom Notepad! The 5" x 7" Full Color BIC Non-Adhesive Custom Notepad is perfect for the home or office! Use the entire sheet, edge to edge, or just the top and bottom - The choice is yours! Order today! Promotional printed notepad sized to handle large full-color logos and leave leave plenty of writing area. The 4" x 6" Full Color BIC Non-Adhesive Custom Notepad is an ideal size to keep in your desk drawer at school, office or at home. An adhesive logo notepads featuring a full color imprint. This pad of custom Post-It Notes are sized to handle large logos. We can make custom notepads for your business or event. For lasting promotional appeal, choose a scratch pad to hand out at your trade booth or convention. Users will see your logo every time they get a thought they need to write down. That's a real mental connection. ePromos offers scratch pads in multiple shapes and sizes, and we also have scratch mouse pads, calendars, and magnets. Promotional notepads are a great way to advertise to people at home or in offices. Our staff can help you find and print paper products that your customers will love. Ordering products and getting them custom imprinted with your name brand or logo is easy with ePromos.